Research on underage drinking can be ordered custom written from Paper Masters. You determine what aspect of underage drinking you want to focus on and our writers produce the statistics, the facts and the research to support your thesis on the perils underage drinking. It goes without saying that in the United States underage drinking is a major cause for concern. And yet many are unaware of just how significant a problem underage drinking is. The facts reveal that alcohol has become the drug of choice for the vast majority of youth in the United States and the pervasiveness of alcohol puts every state, community, and family at risk. The National Household Survey on Drug Abuse reports that there are 11 million drinkers between the ages of 12 and 20 and the results of risky behaviors associated with alcohol consumption among this group are severe. Youth violence, unplanned pregnancies, sexually transmitted disease, suicide, and accident-related deaths are only a few of the results that impact our society daily. And the long-term affect of alcohol abuse and dependence on this group as well as their families and society as a whole is even more dismal. Ultimately, the issue has become a social ill, one that continues to plague our society which, in many respects, has thrown up its hands and said, “kids have always been drinking, what can we do?” While it would be impossible to completely eliminate underage drinking, a combined effort by parents, communities, media, law enforcement and legislators could effectively reduce this national epidemic. The statistics on underage drinking are overwhelming. 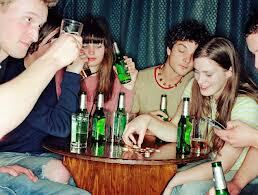 Over 10 million young adults engage in drinking alcohol annually. The average age of first-time alcohol use is 13 years. More than 30 percent have consumed 5 or more drinks in a row in a two-week period. Adolescents who begin drinking before the age of 15 are four times more likely to develop a dependence on alcohol than those who begin drinking after 21. Perhaps the most significant segment of underage age drinking occurs on college campuses throughout the U.S. The national MLDA (minimum legal drinking age) of 21 has been in effect since 1984 and while studies show it has reduced underage drinking by 10-15% as well as the annual motor vehicle fatalities among 18-20 year olds, underage drinking is still widespread among college students. Zero Tolerance term papers discuss the criminology term that imposes an automatic punishment for a rules violation. Alcoholism - Alcoholism research papers explain alcohol abuse and its relation to drug abuse as a medical problem in America today. Addiction to Prescription Medications - Addiction to Prescription Medications Research Papers examine who most commonly gets addicted and how easy it is to become addicted to prescription drugs. Paper Masters writes custom research papers on Underage Drinking and look at the statistics of this problem, and the other risky behaviors that result.